The Unmutual Website is this week indebted to Simon Coward for locating some fantastic materials which date back to 1961. 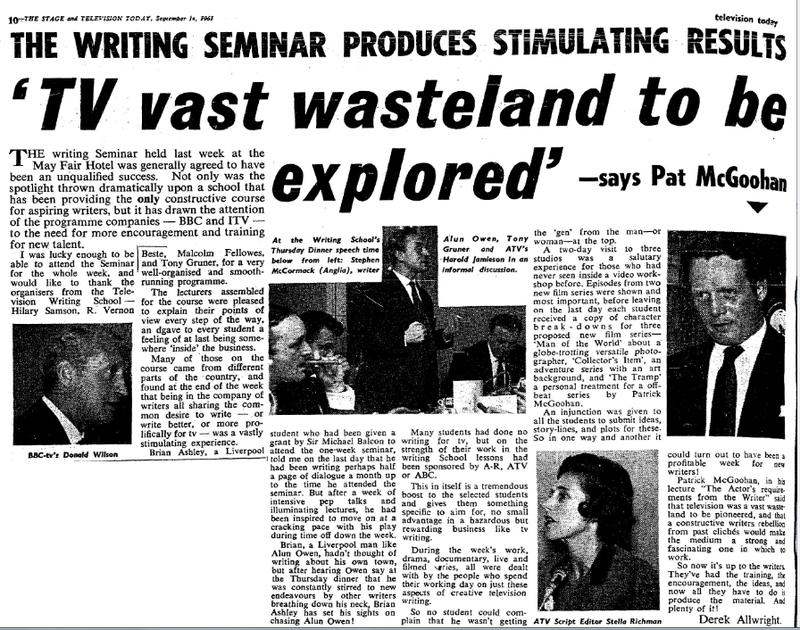 It appears that at the 'First TV industry writing seminar', organised by the Television Writing School, had the involvement of none other than Patrick McGoohan, who gave a 4.00pm lecture at the seminar, entitled 'the actor's requirements from the writer' and presented a script treatment for something called 'The Tramp' (which may or may not have been related to he and Lewis Greifer's 'Vagabond' series 'The Outsider', which was planned for the late 1960s but never made. As well as the initial advertisement, Simon has also located a review of the event and of the lecture. Patrick McGoohan, star of ITC’s Danger Man series, has formed an independent production company whose first project, to be implemented shortly, is a feature film (title undecided) to he made at MGM studios, Elstree. Script has been written by McGoohan from an idea of his own which was elaborated for him. McGoohan will direct, but will not act in the film. Apart from this, plans are being laid for a TV film series to be made by his company. He has had this project in mind for some time and he hopes to set up the deal in the near future. I believe that, on his record, he will get willing and substantial backing.